Dyne.org and the City of Scaletta Zanclea we are proud to announce the fourth edition of Trasformatorio in Sicily. Trasformatorio is an international laboratory focusing on practices related to site-specific performance. Born in 2013 as a laboratory for performance art and hacking, Trasformatorio is part of the experimental research methodology of dyne.org, an international no-profit foundation and think tank based in Amsterdam. Trasformatorio intends to develop original research, to produce and distribute innovative technical and artistic contents, to improve and invent new ways of establishing contact with social and environmental discourses. Trasformatorio is aimed to inclusion, respect of the environment and of human and animal elements that interact with it. The laboratory is held within the territory that explores and uses transformation as a paradigm for work. Trasformatorio is interested in working with forms of spectacles that can be prepared and delivered in any context, of the theatre and electricity grids. Spectacles that reflect on the microculture of the places they are developed in and from. Trasformatorio is proposed to professionals: actors, musicians, designers, architects, set designers, video/filmmakers, dancers and performers, photographers, hackers, students of applied arts, theatre studies and fine arts, independent researchers and academics alike. An equal number of spaces are reserved for artists from Sicily and genders are balanced. 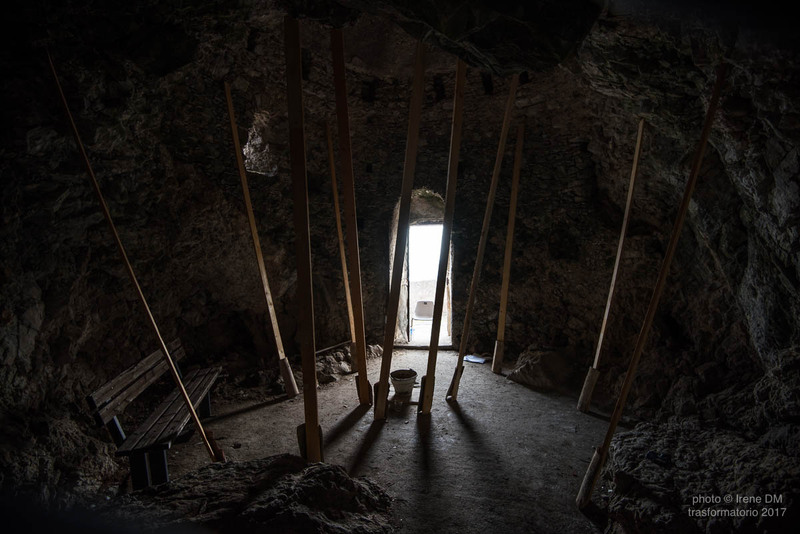 This edition will be held for the second year in Scaletta Zanclea, using the “borgo”, the mountain and the sea and the surroundings of the Castle “Rufo Ruffo” as basic materials for the artists work. 2018 What is going to happen? This is a research that has to be conducted within an ethic exchange, responding to the specific environment (= people, history, space, nature) of Scaletta Zanclea. Trasformatorio has been in Scaletta for the first contact in April 2017 so you would join a process in the making in its second iteration with some new artists and various platforms to experiment with. Trasformatorio ethics is that participants share and co-develop their skills into new ones. So all participants are therefore considered co-producers of Trasformatorio. Trasformatorio 2018 will hold also the first iteration of the projectITERATIONS (iterations.space). Iterations consist of a series of artist residencies, exhibitions, reflection meetings and exchanges, that take place between 2017 and 2020. Artists and cultural practitioners are welcomed in situations to experiment with and reflect on what the future of collectivity, sharing and working together in digital and networked contexts can look like. The project is initiated by four organisations who have a clear affinity with open approaches towards art, technology and society, and who feel a shared necessity to research the conditions in which artists who use technology work. These organisations are Constant (Brussel), Hangar (Barcellona), Esc (Gratz) and Dyne.org (Amsterdam). Trasformatorio 2018 will trigger as well a collaboration with WISH – World International Sicilian Heritage that will be part of BIAS 2018 in Palermo. BIAS is the acronym of International Biennial Contemporary Art Exhibition of the Religions of Humanity and is a transnational exhibition of contemporary art organized in the historic centre of Palermo and in locations around Sicily. For BIAS theme we will select if there will be, projects in the theme of this year, that could develop further and become part of the 2018 exhibition. The theme of this year is: “The doorstep is the longest part of the journey”. The practitioners’ explorations will be presented at the end to different audiences, in multiple ways, according to the content, character and state of development of ideas and performance material, without any obligation for the participants to show their work. The documentation will be shared from Trasformatorio site. Fill in the form and send your application, with the supporting material (you can also upload on this site with the tool offered in the form) and a letter of motivation at fredd@dyne.org. NB There are only 20 places available. The candidatures will be chosen by Trasformatorio to fill the available places within an open internal process of selection. The micro economy of the Trasformatorio requires involvement, elasticity and patience. Is also an experiment, a precious one in itself. All activities and workshops on site will be free of charge for participating artists. NB: This year we have some budget as a contribution to transportation as part of the “Iterations” Creative Europe project. It will be dealt with in an open process by the community to be sure all selected artists can participate. In any case, Trasformatorio will issue letters of invitation for the selected participants willing to apply for travel grants. Trasformatorio 2018 is co-funded through a Creative Europe subsidy of the European Commission. Federico is an artist, a researcher, and a multimedia art producer. He is based in Amsterdam and works with dyne.org software foundry and think-and-do-tank.